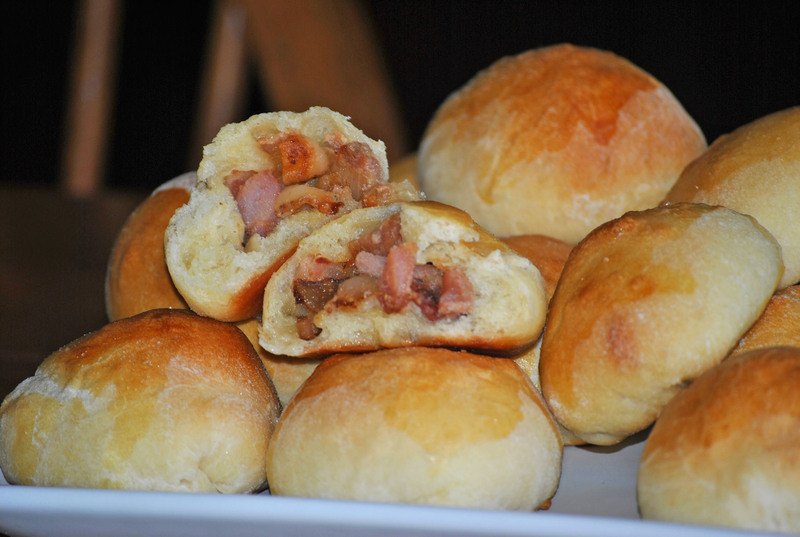 I made bacon buns the other day. Have you ever had the pleasure? 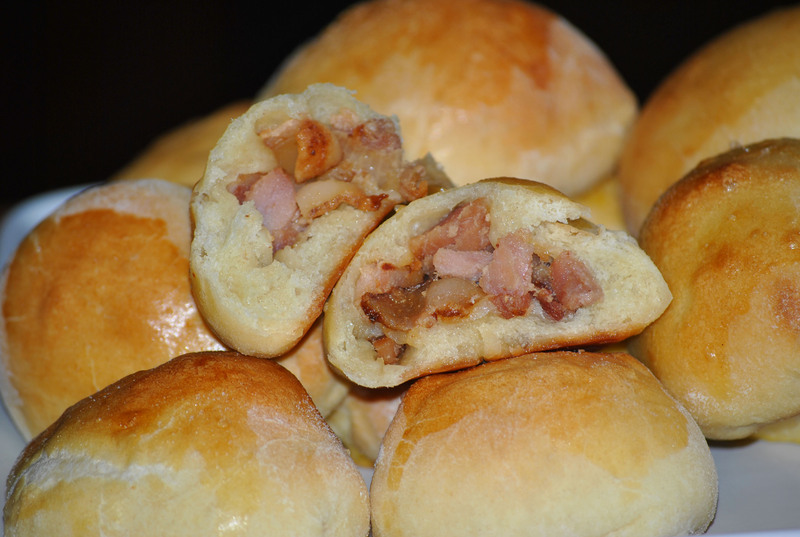 They are exactly as they sound, buns made with bacon (and ham too). Where I lived as a girl you could get them in almost any bakery, but you needed to get them early because they sold out quickly. My mother would make them, sometimes, and they never lasted in our house. When I mention bacon buns now, everyone I talk to has never heard of them. I guess it’s a south side thing and even though I’m still in the same state I grew up in, sometimes it’s like being on another planet. The beauty of these buns are their versatility. You can have them along side a salad, or soup. You can eat them instead of a sandwich. The sweet dough and salty middle come together so well, you can’t eat just one. If you have leftover, these freeze well. For the filling: fry the bacon until crisp and drain the fat. Add the onion and ham, saute for five minutes until the onion is tender. Cool the mixture thoroughly. This can be made ahead and frozen. Dough: Melt the butter in a sauce pan and add the milk until scalded. Add the sugar and the salt and let cool. Dissolve the yeast in 1/2 C of the liquid for about 5 minutes. Beat 5 eggs slightly and add the remaining milk mixture to the eggs. Blend and add the yeast mixture to the egg mixture. Add 5 C of flour to the egg mixture. Slowly add additional flour until the dough starts to come away from the bowl. You may not use all of the flour. It will still be sticky. Knead the dough for about 8 minutes. 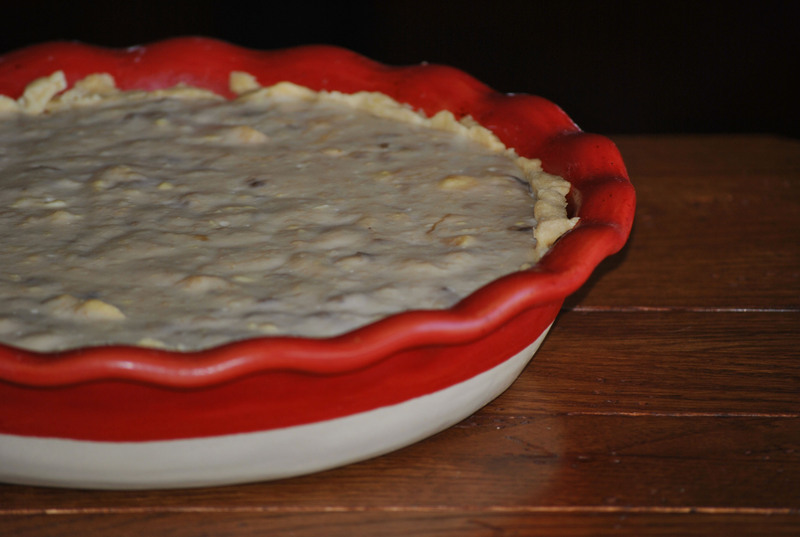 Place the dough in a greased bowl and let it rise until double its size. Punch down the dough and let it rise again. Generously flour the counter and roll out the dough to about 1/8 inch thickness. Use a 4-inch round cutter to cut the dough. I used the same glass I use for pierogi. Place a spoonful of cooled filling in the center of the dough, pinch all the corners together sealing tightly. Place the bun, seal side down, on a parchment paper lined cookie sheet. Let rise one more time, about 30 minutes. Beat the last egg and brush over the tops of the buns. Bake for 15 minutes in a preheated 350 degree oven. Makes 3 1/2 dozen buns. Last week Meeshie was sick. Since I, of course, stayed home with her I baked. In case you aren’t aware of it, I love to bake. I love to bake things that we all enjoy and I love to bake new things. I came across this recipe back at the end of the summer and have been waiting to try it. It mainly caught my eye because of the cherries. I’ve had a jar of cherries from Williams Sonoma in the pantry for a while, just waiting to be used for some delectable treat. Have you ever had their cherries? They are divine and make anything better. The original recipe calls for pitted cherries and almond paste, but I didn’t realize until I began that I didn’t have the paste so I used almond filling instead. I always have that on hand for kolaczky. The flavor was fine, but I think the consistency of the batter is definitely different that what was intended by the original recipe. I also added about 3/4 of a cup of crushed Almond Honey Bunches of Oats to the batter and adjusted the flour accordingly. Lovely. Mix together 1 cup of sugar, the flour, cereal, baking powder, salt, egg, and almond extract. Add the almond filling. Using a pastry cutter or your fingers, cut butter chunks into the mix. It should be crumbly. In a separate bowl, mix together sugar, cornstarch, cherries. In a 9×13 pan press half of the crumb mixture in the bottom. 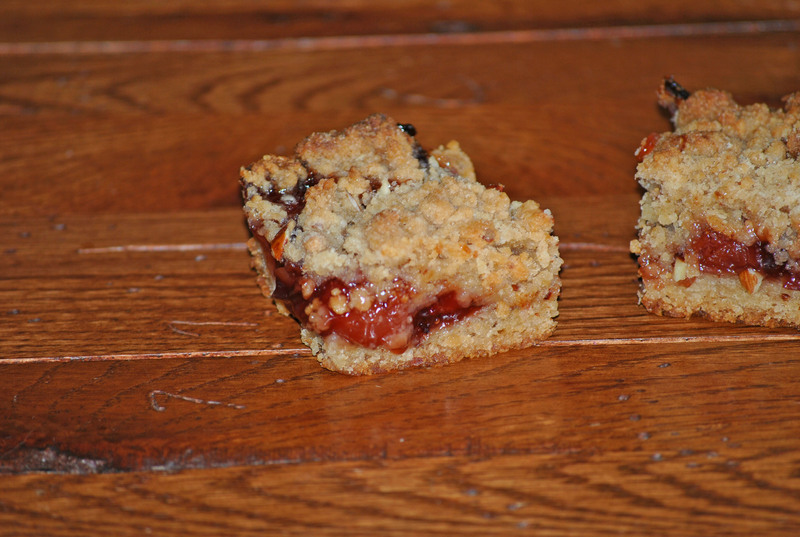 Top with the cherry mixture. Spread into an even layer. Mix the sliced almonds into the remaining crumb mixture. 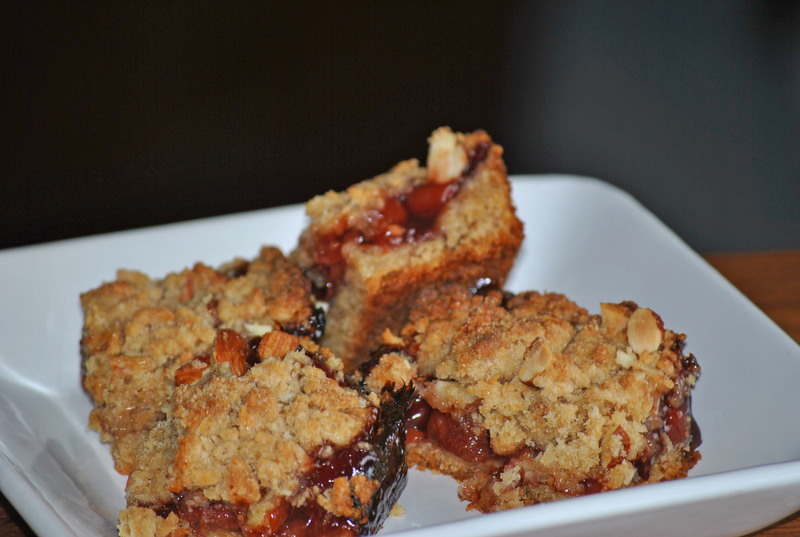 Top the fruit with the crumb mixture in an even layer. Bake at 375 degrees for 45 minutes or until top is lightly browned. Allow to cool slightly before eating. 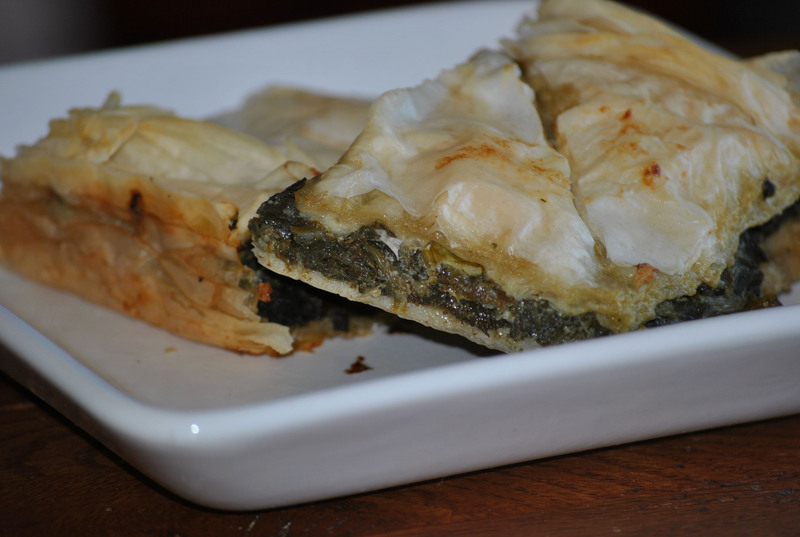 I love spanakopita. I was introduced to this dish back in high school. 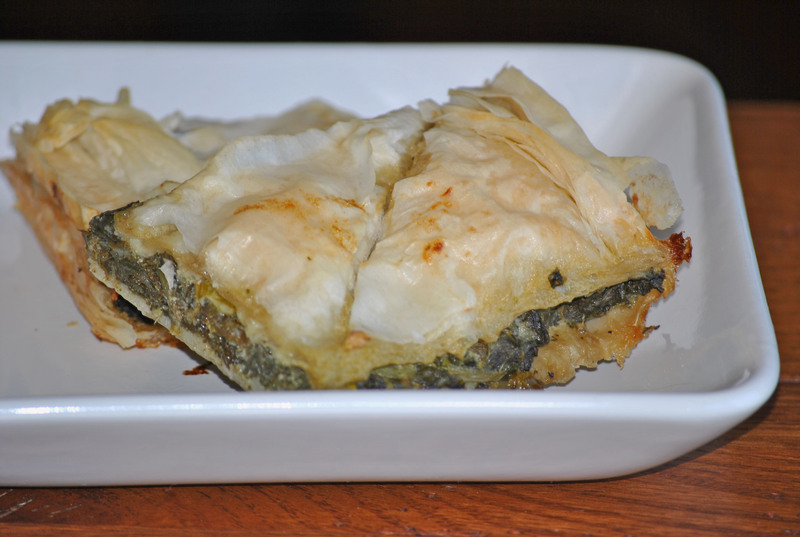 One of my good friend’s, at the time, mother made the best spanakopita. The phyllo dough, spinach and dill really make this dish. I don’t even mind that there’s feta in there. It’s the perfect meatless meal. I used to buy it from Trader Joe’s, and their version is pretty good, but now I don’t have to. I was able to make the filling a few days before assembly which made assembly a breeze. This actually makes enough for two baking dishes. I stick one in the freezer. The other thing that I do is fold the phyllo in half to fit inside the dish therefore doubling each layer. (There are about 24 sheets in a box. I used 6 sheets for each layer which equaled 12.) You can use butter instead of olive oil, but the oil is easier to work with on the dough. For the filling: Heat a large skillet and add olive oil. Add the spinach and saute until wilted. Remove from pan and place in a large bowl. Add the green onion to the pan and saute for about 4 minutes. Add the onion to the spinach along with the dill, cheese and eggs. Combine well and add the salt and pepper. Set aside to cool. Unwrap the phyllo dough on a flat surface and cover with a damp towel. Oil a baking dish. Place half of the sheets in the bottom of the dish, brushing each sheet with olive oil as it is added. Add the filling and then spread the remaining phyllo dough on top, again brushing each sheet with olive oil as it is added. Cut into squares before baking and score the top in the shape of a triangle. You can cut it into triangles if you wish to serve this as an appetizer, but if eaten as a meal I like to make them into squares. Bake for 40-45 minutes or until the top is golden brown. You can serve this hot or cold with your favorite salad. I made these on my Panini, but it’s not mandatory. We love grilled cheese and I’m always looking for ways to enjoy it. Remember the five cheese grilled cheese? This sandwich is twisted because I used the spinach balls inside. They were a perfect addition to the sandwich and easy to work with. So simple, yet so good. I love a meal like that. I especially love it during Lent. This is a perfect Friday meal served with a salad or your favorite soup. 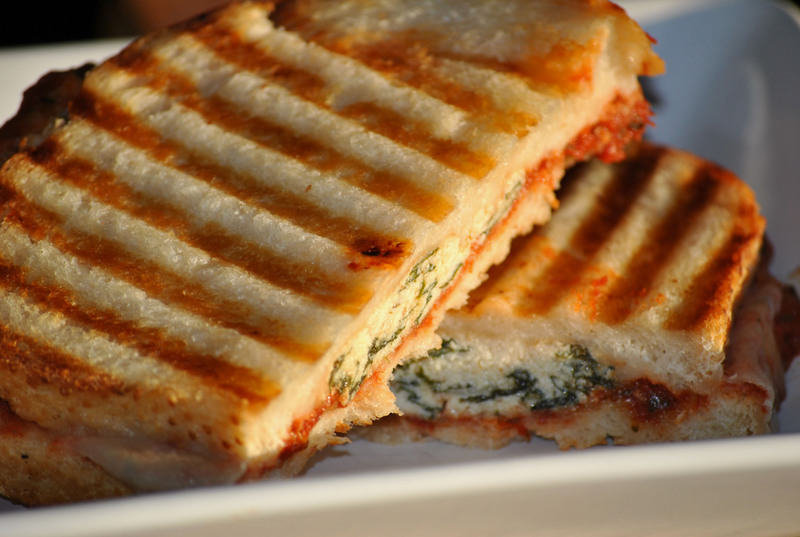 Assemble the sandwich by placing the provolone, spinach balls and a spoonful of marinara on one of the slices of sourdough. Place the other piece of sourdough on top to make the sandwich. Drizzle olive oil on top of the bread. Place the sandwich, olive oil side down, on the griddle and drizzle additional olive oil on top of the sourdough. 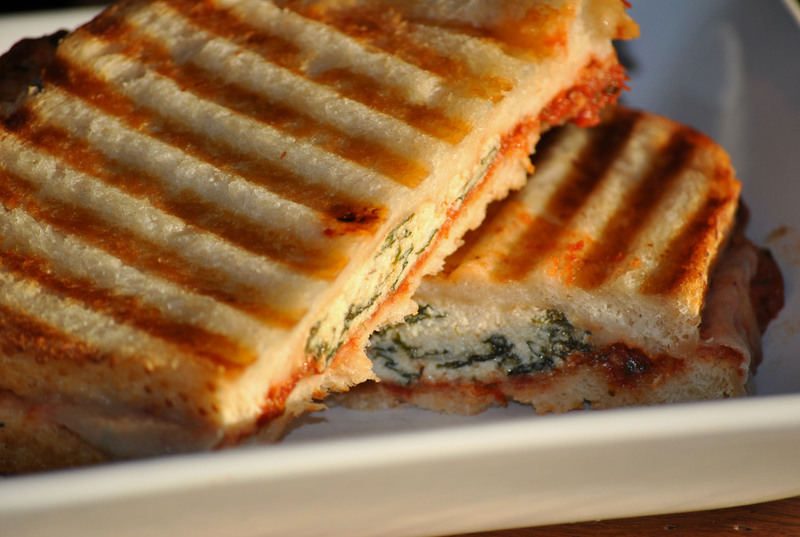 Cover with additional parchment paper, pressing the Panini closed. Cook for 5-6 minutes until cheese has melted. Cut in half and serve warm. It seems like I’m on a pie kick, but really I’m not. I did make this pie after seeing Hoosier Mama on television. I liked that she mashed the bananas up and incorporated them into the pie. I really don’t like banana cream pies that have the bananas sliced on the bottom of the pie. Banana cream pie should really scream banana, right? So I found a recipe that I thought I could use and tweaked it to my liking. Loved this pie. Truly this was so yummy. We topped it with some whipped cream and slivered almonds. But I can also see that you could crush some banana chips and place them on top. I used the same blind baking method for the pie crust as I do with the sugar cream pie. Coffee filter and beans on the bottom of the pie and cook it in a 400 degree oven for about 20-25 minutes. It’s best to make this pie on the morning you plan to serve it. When the custard was still warmish I asked my husband to sample it and he didn’t like it. Once the custard cooled down though, everyone was digging in and demanding seconds. Meeshie thought this was awesome. It was. This is a close second to the sugar cream pie and if you like bananas you are going to love this pie. In a large saucepan, scald the milk by heating it until it just begins to boil. Combine the sugar, flour and salt and then gradually stir into the scalded milk. Over medium heat, stirring constantly, cook until thickened. Combine the 3 egg yolks in a small bowl and beat lightly. Stir a small amount of the hot mixture into beaten yolks; then when thoroughly combined, stir the yolks into the hot mixture – this prevents the eggs from scrambling in the custard. Cook for one minute longer, stirring constantly. Remove from heat and blend in the butter and vanilla. 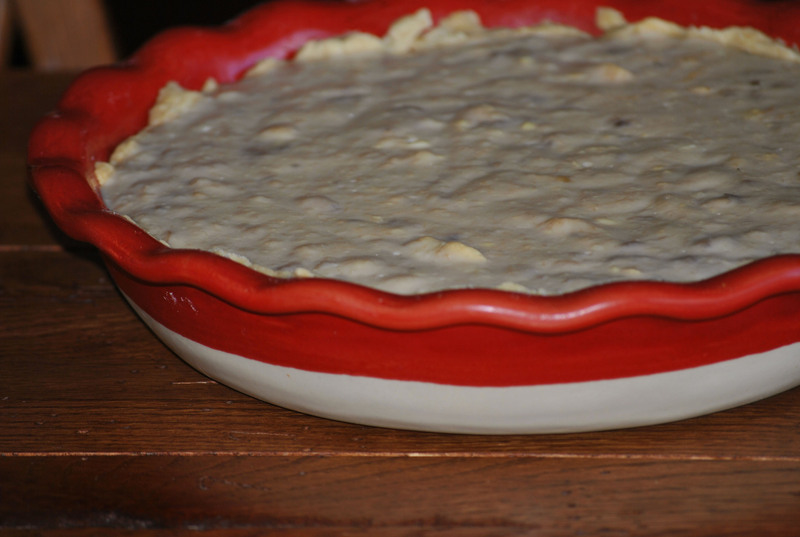 Allow to sit until lukewarm and add the mashed bananas. Pour mixture into prepared pie crust. Allow to set in the refrigerator for at least an hour. Top pie with fresh whipped cream and slivered almonds, if desired. I love bread. It is the perfect food. I love bread so much that I gave it up for lent last year. I’ve done it before and let me tell you it’s really hard. Bread makes everything better. 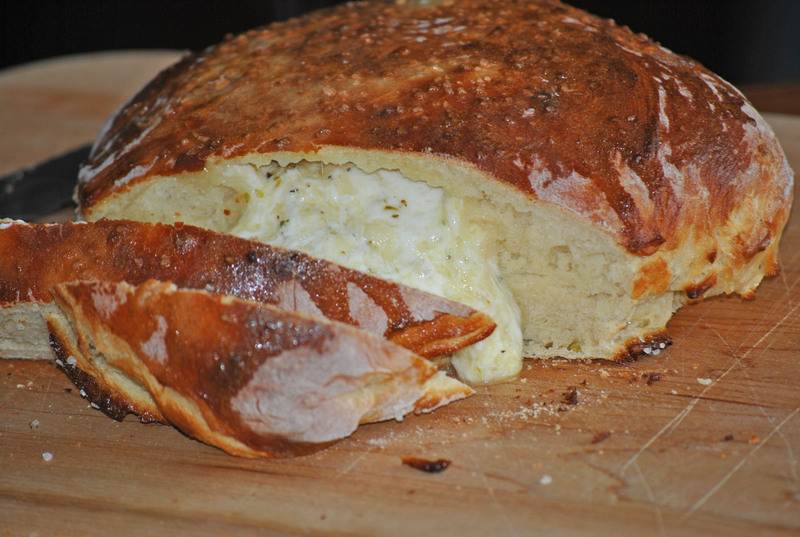 This cheese bread really was an awesome side to dinner. We grilled over the weekend. I have spring fever and so does my husband. He moved the grill onto the patio along with the patio furniture over the weekend. We do grill over the winter, but since the grill is stored in the garage we don’t do it as often as we like. 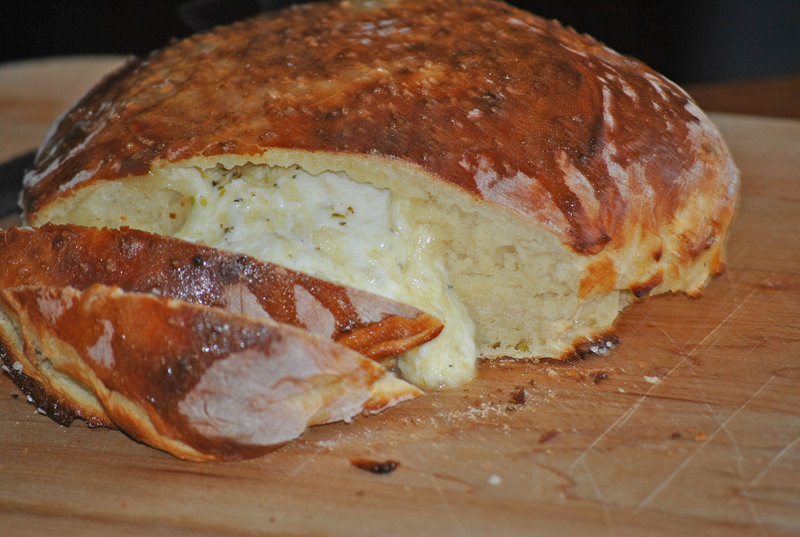 We grilled pork chops and I made this easy cheese bread. This bread could easily be made into cheese stuffed rolls. I also think that you can go wild with the cheese combinations. I actually didn’t have any Havarti on hand and used some Dubliner Irish cheese. Dubliner cheese is dry like Parmesan cheese but slightly sweeter and nuttier. Sprinkle yeast over warm water and stir in sugar. Let stand until frothy, about 5 minutes. Mix salt and flour in a bowl, then stir in egg and the yeast mixture to form a dough. Using your hands knead until smooth and elastic (dough should pull away from sides of the bowl but stick to the bottom – add flour by the teaspoon until it tightens up), about 10 minutes. Form into a ball and let rest in a bowl on the counter, covered with plastic wrap, punching down with a wet fist every hour, for at least 2 hours and up to 3. Turn out dough onto floured countertop, turning to coat, then flatten into a 7-inch disk. Toss together cheeses, some sea salt and some basil. Press into a compact 3-inch ball with your hands. Place ball in middle of dough, then gather dough up around ball of cheese, squeezing excess dough together on top to enclose the cheese. Then begin to flatten ball into a disk, pressing down from the top and spreading cheese out from center, until dough is an 11-inch disk. Dust with an egg wash and sprinkle with additional sea salt. Place on a parchment lined cookie sheet and bake 12-15 minutes. Here’s the original. I altered the cooking style slightly as well as added the sea salt. 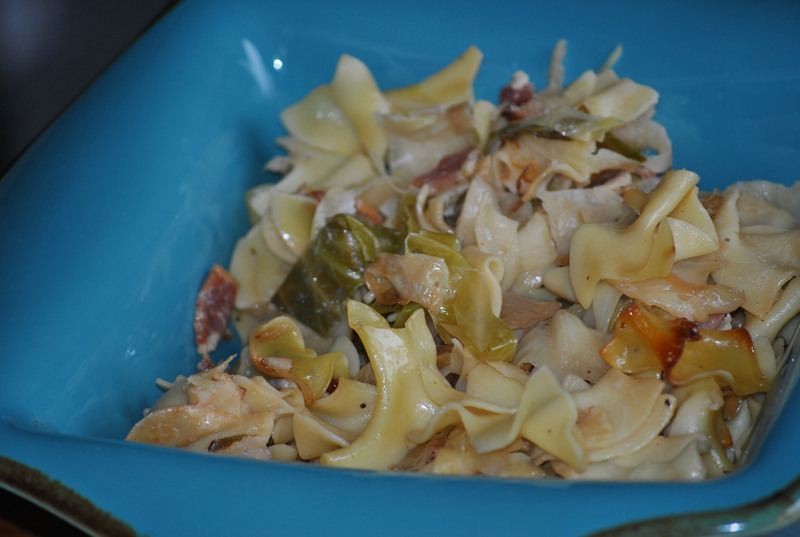 Again it’s so versatile you can really do so much with this simple delicious recipe. I make this side every year for St. Patrick’s Day. 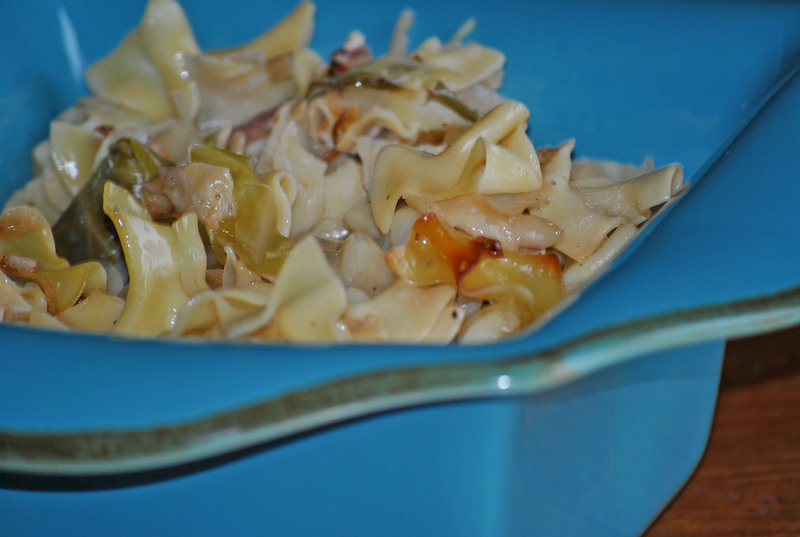 It’s a great way to serve cabbage, but I don’t limit this dish to once a year. That’s because it’s a Polish noodle dish that has nothing really to do with St. Patrick’s Day. It’s the bacon. Bacon makes everything taste great. Although the title of this post implies that this is a side dish, it’s more than that. This can be served as a side but it is also a great main dish too. Perfect for a potluck or a midweek meal. I don’t really have a recipe for this one, kind of like my potato pancake recipe. I more or less throw everything together and step back and enjoy. In a saute pan, saute the onion in butter or bacon grease for about 5 minutes. Add the cabbage and continue to saute until wilted. Set aside. In a separate pan, saute the diced bacon until crispy. Cook the noodles as directed. Combine the bacon and grease to the cabbage mixture. Add the cooked noodles, a sprinkle of salt and lots of pepper. Stir to incorporate. Place the mixture into a 9×13 pan and cook, covered, in a 350 degrees oven for about 30 minutes. You are currently browsing the Meeshiesmom's Blog blog archives for March, 2011.